Ketchup on your Frankenburger? | Jon Katz, P.C. Sep 19, 2008 Ketchup on your Frankenburger? First the FDA approved the safety of cloned offspring on your plate. Now it’s genetically modified chicken, What next? When I was in summer camp, my eyelids needed velcro to stay open as I read a friend’s letter telling me about the tomatoes his mother was growing. Of course, that was when I still ate meat. Now, I yearn for the times when I did not need to revert exclusively to the garden to be assured that the genes of my food had not been altered in a petri dish. At least my veganism does not make me a victim of the next step in all this genetic manipulation. 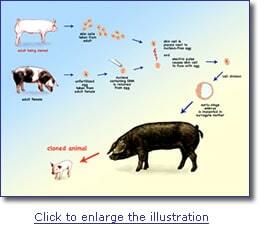 Coming to a slaughterhouse near you are animaloids cloned to your desire. You want more white meat on your chicken? Cloned to order. Richer egg yolks? Cloned to your satisfaction .Less fart/methane pollution from cows? Well, scientists can only go so far in one day to create freaks of nature. What about any pain or suffering such Brave New World tactics will cause the animals? Perhaps hitting more home: How long before the genetic modification of human babies? You say that is impossible? How about all those who at first thought the cloned Dolly the sheep was a hoax? Maybe a pox on the house, but not a hoax. Government bureaucrats and technocrats often have a way to extract any human emotions from draft federal regulations and guidelines. (Can you imagine if such folks talked the same way at cocktail parties as they do in their draft regulations?) That is no different from todays new FDA-proposed guidelines for permitting genetically-modified animals. So, get out the velcro to hold your eyelids open, pop open a cold one (or is that genetically modified, too? ), and read and comment on the FDA’s proposed guidelines to permit animal genetic modification.